Skill Or Chance? Question Looms Over Fantasy Sports Industry Daily fantasy sports companies are in a battle with New York's attorney general over the legality of their games. A judge there will weigh in on whether fantasy sports is based on skill or chance. New York's attorney general's office has filed lawsuits against the two biggest daily fantasy sports companies, FanDuel and DraftKings, demanding that they stop taking bets in New York. A New York judge will weigh in on Wednesday whether fantasy sports is based on skill or chance. 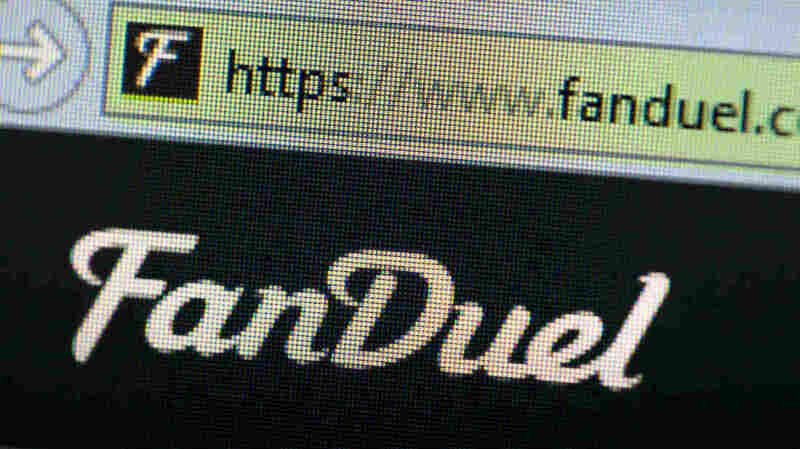 New York's attorney general's office has filed lawsuits against the two biggest daily fantasy sports companies, FanDuel and DraftKings, demanding that they stop taking bets in New York because their games are based on chance, which makes them gambling and illegal under New York state law. Daily fantasy sports companies insist that their games are legal because they're based on skill. The case is hugely important to daily fantasy sports companies. Not only do more than 10 percent of all daily fantasy sports players live in New York, but a ruling there could influence courts in other states. So are daily fantasy sports games of skill or chance? Let's take a look at the case for both. Mike Petta is what you might call a shark in the world of daily fantasy sports. He started playing three years ago — for fun — using the old AOL screen name he had when he was 12 as an ID. "I was Hoop2410 and now I'm stuck with it, unfortunately," he says. "No going back." The reason Petta says that's unfortunate, is because Hoop2410 is now his full-time alias. He quit his job as an accountant last year, and now the 31-year old father of two works from his home outside of Detroit, playing daily fantasy sports for a living, which is more work than you might think. Petta plays anywhere from 500 to 1,000 "different unique contests," in daily fantasy sports a day — putting anywhere from $10,000 to $40,000 on lineups of players in almost every professional sports league. Petta doesn't win all of those contests. As a professional, he says, "if I can return 110 percent — a 10 percent profit — that's acceptable and the number people shoot for." And most of the time, he achieves that. Hoop2410 is the 8th ranked player on Rotogrinder, a website that compiles the top daily fantasy sports players across multiple platforms. It's a ranking Petta attributes to hours of research, spreadsheets, self-made algorithms and gut feelings. He doesn't want to say exactly how much he's earned playing daily fantasy sports, but says it was over six figures in the last year. Petta is an elite daily fantasy sports player, a shark, as research and consulting firm McKinsey & Company calls them in a recent report. In that report, analysts found that through the first half of last year's Major League Baseball season, 91 percent of the daily fantasy sports profits were won by just 1.3 percent of the players — people like Petta. Those findings and his own experience makes the question of skill or chance clear to Petta. "The people that are good in this industry are winning at a much higher rate than the people that are not as good," he says. "So to me it has to be a game of skill, and I don't really think there's an argument that can be made against that." Petta's not alone in that assessment. Dan Eaton, a lawyer and professor at San Diego State University, says that daily fantasy sports are not gambling. "You're not talking about just accepting the cards that you are dealt," he says. "You pick your cards." For comparison, Eaton says, look at the stock market. "I mean, how much control, really, do you have over enterprises in which you buy stock? Virtually none," he says. "You do research, you analyze at the market, you take advice from advisers and you invest your money. That's not gambling." The fact that someone like Warren Buffett will do better at it than you is not a function of luck, Eaton says. "It's a function of his analytical skills and the vast level of experience he has in markets." he says. Dr. Timothy Fong, co-director of the UCLA Gambling Studies Program, has a different take. "We define gambling very simply as placing something of value at risk to be won or lost on an event of uncertain outcomes in the hopes of winning a larger reward," Fong says. Applying that to the stock market or real estate speculating doesn't fit, he says, because both of those industries are regulated, and the definition of gambling — at least from a legal perspective — is largely applied to games meant as entertainment, like daily fantasy sports. Apply that same definition to daily fantasy sports though, and there's no question, Fong says: "This is absolutely gambling." Look at the uncertainties involved in daily fantasy sports, he says. "One day performance. You could have injuries. You could have a player just go off that night, who had no intention of it before," Fong says. In his mind, that makes them clearly a game of chance. Here's where it gets tricky though. Fong admits that skill also plays a factor in daily fantasy sports; just like Petta, and Eaton admit that chance is also at play. So the truth is, daily fantasy sports are based on a degree of both. Eaton describes them as sitting somewhere on a continuum between chance and skill. And that makes their legal future murky. Most gambling experts, like Darren Heitner, a sports attorney and contributor to Forbes magazine, agree that the future of daily fantasy sports is likely to be determined on a state-by-state basis, where the question won't be whether they're games of skill or chance, but "how much skill or chance are involved in these competitions," Heitner says. That could favor daily fantasy sports operators in a lot of places. To be classified as gambling, Heitner says, "in most states, you have to show that chance actually predominates over skill." In New York though — where the court will look at this Wednesday — it's different. New York law says a contest is a game of chance if "the outcome depends in a material degree upon an element of chance, notwithstanding that skill of the contestants may also be a factor therein." Catch that last part? Elements of skill don't matter. So, Heitner says, "All that the New York Attorney General has to show is that chance is a material element of these daily fantasy competitions" and they'll be legally defined as gambling and illegal under state law.